Athaliah chased from the Temple. By Charles Antoine Coypel. Athaliah (Hebrew: עתליה, ʻAthalyāh; "Name means::YHWH is exalted") (929-r. 886-879 BC according to Ussher or 884-r. 841-835BC according to Thiele) was a princess of the House of Omri and a vicereine and queen in the Kingdom of Judah. She was the only woman ever to occupy the throne of either kingdom in her own right. She is also remembered for introducing Baalism to the Kingdom of Judah and for trying to destroy the House of David and seize power in the Kingdom of Judah, until a high priest and his wife would defeat her. When she was nine, her father became king of the Kingdom of Israel on Omri's death. Jezebel came from Sidon, in Phoenician country (known as "The Levant" today), where Baalism had lately become prominent. Jezebel introduced this false religion to the Kingdom of Israel. That she also introduced it to her daughter as well as to her sons is only reasonable to assume. 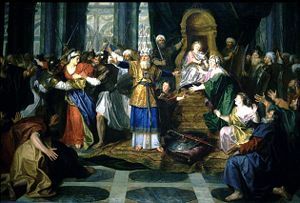 When Athaliah was twenty, she married Jehoram, son of King Jehoshaphat of the Kingdom of Judah, to seal a treaty between Jehoshaphat and her father. (2_Chronicles 21:6 ) She bore him at least one son, Ahaziah, who at the age of twenty-two would reign alone in the Kingdom of Judah for less than a year. This last might explain an anomalous verse by the Chronicler, in which he seems to state that Ahaziah was 42 years old when he began to reign. In fact, Ahaziah was not 42 years of age, but the House of Omri had lasted this long. 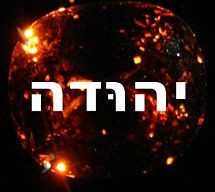 Perhaps Athaliah was born in the year that Omri's civil war began. Toward the end of the reign of Jehoshaphat, Jehoram became viceroy of the Kingdom of Judah—and immediately after Jehoshaphat died, Jehoram murdered all his brothers and several minor princes. Whether Athaliah incited him to do this or merely learned from his example, the Bible does not make clear. In any case, the Bible clearly credits her with (or, perhaps more properly, blames her for) introducing the worship of Baal to the Kingdom of Judah, as her mother Jezebel had done in the Kingdom of Israel. Athaliah survived the Philistine-Arabian raid that destroyed much of the rest of the royal family, as did her son Ahaziah. She watched as her husband suffered a severe gastrointestinal disease, and also watched her husband's death and the coronation of her son. Kestner comments that the Bible nowhere criticized Athaliah for being a woman reigning in her own right, but rather for her wicked deeds, first in introducing Baalism to the kingdom and then in trying to exterminate the entire royal family. ↑ 4.0 4.1 4.2 4.3 4.4 4.5 Konig, George. "Athaliah, Queen of Judah." About Bible Prophecy, 2007. Retrieved June 11, 2007. ↑ 6.0 6.1 6.2 6.3 Authors unknown. "Athaliah." The Columbia Encyclopedia, 6th ed., 2007. Retrieved June 11, 2007. ↑ 7.0 7.1 7.2 7.3 Authors unknown. "Entry for Athaliah." WebBible Encyclopedia. Retrieved June 11, 2007. ↑ Kestner, Jackie. "Entry for Athaliah." Alabaster Jars Ministry. Retrieved June 11, 2007. This page was last modified on 8 June 2010, at 02:17.